Bodie, California, is perhaps one of the best-preserved ghost towns in the western United States. It was once home to more than 10,000 gold-seekers. The wild, wide-open gold mining town was so bad that some thought even God had forsaken it. Today, it has almost 200 structures still standing. The town is preserved in a state of "arrested decay," which means they don't repair anything. They don't let anything collapse, either. Bodie appeals to most everyone who shows up there, but especially to those who enjoy stories of the Gold Rush and Old West. Bodie ghost town became a California state park in 1962. 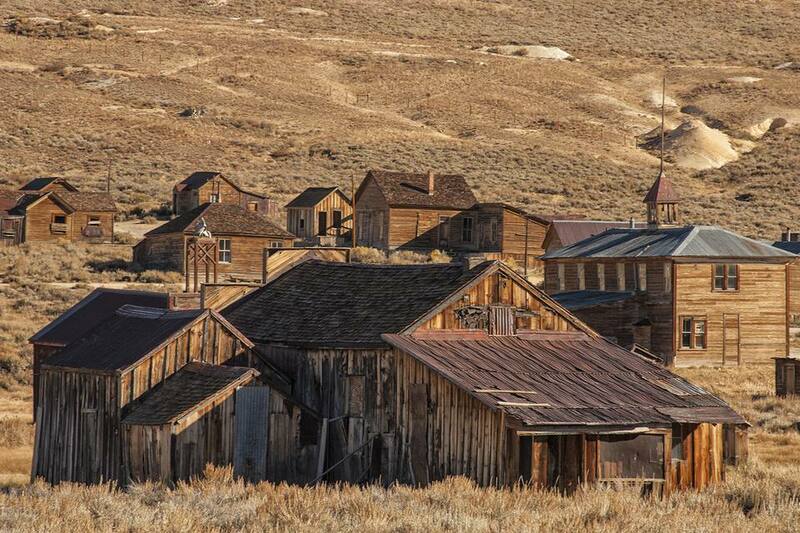 During California's fiscal crisis, Friends of Bodie pitched in to keep it open. We applaud their initiative and if you do, too, you can donate at their website. So much of old Bodie remains that it's easy to imagine the rest, with houses and businesses lining the streets. The church, a residence, and a few other buildings are usually open to the public, as is the museum. Occasionally, costumed docents walk the streets, adding to the atmosphere. Free tours can take you inside the old ore-processing stamp mill. Others take you around town to learn more about its history. We've been in bunches of ghost towns all over the west and Bodie is - by a large margin - the most fun. They don't have fake gunfights on the main street or musical shows in the saloon. Instead, this is the place to get the best idea of how a gold rush town might have looked. And even better: within limits, you're free to wander around at your pace. If you're a photographer, bring plenty of media and plan to stay a long time. You'll likely end up spending more time in Bodie than you expected. The elevation makes it dry, and you'll get thirsty. You can buy bottled water at the museum, but no food is available. Bodie is at 8,375 feet elevation. Because of its altitude and desert location, the air in Bodie, California is exceptionally dry, and sunburn risk is high. Find out what you should do before you go to the mountains to stay comfortable. Plan to spend several hours to all day, depending on whether you take any guided tours. During summer, Bodie is open longer than in winter. They give more tours, but it can get hot at mid-day. For the best photographs, stick around as late as you can. Don't pay too much attention to the official address. Bodie, California, is actually located 13 miles east of US 395 between Lee Vining and Bridgeport. The first 10 miles of road is paved and take about 15 minutes to drive. The last 3 miles of dirt road seem to be perpetually washboarded and can take 10 minutes or more to cross. The drive to Bodie, California is not recommended for anyone with severe back or neck problems or any other condition that could be aggravated by the bumps. That isn't just one of those cheesy warnings that's required by law. Take it from someone who's driven it more than once.